Set filter on length of filenames, eg. to analyze the file system when copying it to a new directory structure (path+filename, filename only, >, =, Output the list directly to the default printer. 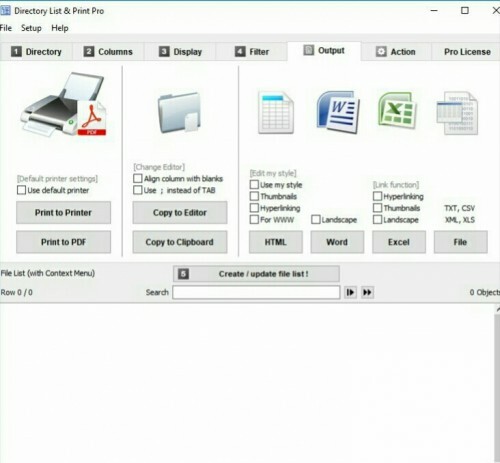 Output the list as PDF file (page size is adjusted automatically up to A0). Output the list as HTML table, with absolute Windows file paths for local use or with relative addresses for the web server, fonts and colors customizable. Output the list as XML file, including all selected attributes. Output the list as comma- or tab-delimited file or CSV file. Output the list directly to Microsoft Word™ and Excel™. Linking of files and directories in Excel™ and HTML output for direct open by mouse click.